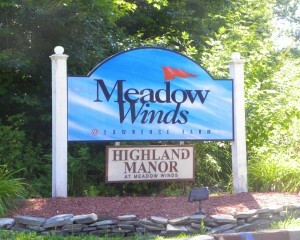 A Residential Community in Newburgh NY, Meadow Winds provides home ownership with various lifestyles in mind. Homeowners can enjoy Condominiums, Townhouses and Single family homes. Unique and affordable, Meadow Winds offers many convenient features to their residents and it is managed by the homeowners association. Features include a club house, outdoor swimming pool, playgrounds and tennis courts. Students that live in Meadow Winds attend the Newburgh Enlarged City School District. At an elevation of 489 feet high, Meadow Winds showcases some rather spectacular panoramic views of the Hudson Valley. On a clear day you can look out over the mountains for miles. At Meadow Winds there is something for everyone. Whether you are a busy professional searching for a convenient lifestyle, buying your first home or just moving to your next home, Meadow Winds is a popular choice. Location to the thruway and Metro North is a preferred location for an easy to commute to NYC. Over 300 units make up this subdivision of homes. At any given time a home is for sale and a new buyer moving in. Easy to see the attraction here as location and value are quite obvious. Check out the current inventory of homes for sale and if you are looking to buy or sell in Meadow Winds let me know how I can help. Looking for a Rental? Yes, some units are available for rent. Call or email me to see what is on the market today.